Advance Acoustics K Center Black High fidelity central loudspeaker : 3 drivers-2 ways. 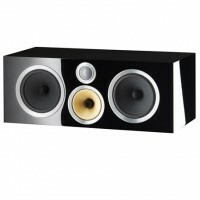 Power hand..
Advance Acoustics K Center White High fidelity central loudspeaker : 3 drivers-2 ways. Power hand..
B&W HTM61 S2 Center Speaker The perfect partner for the 683 S2 HTM61 S2 The per..
B&W HTM62 S2 Center Speaker Ideal at the centre of most home theatre systems HTM62 S..
Cambridge Audio Aero 5 Center Speaker Premium centre speaker Aero 5 ..
Cambridge Audio SX 70 Center Speaker Entry Level Center Speaker SX-70 ..
Chario Constellation Phoenix Center 2-way vented center channel Constalletion Phoenix ..
Chario Constellation Phoenix Center 2-way vented center channel Constellation Phoenix ..